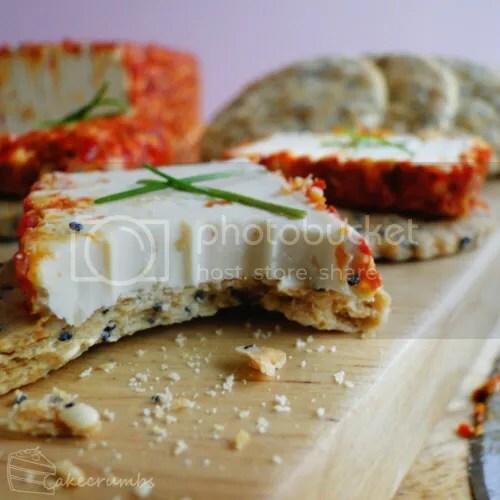 The challenge required us to bake two crackers using two of three methods: hand rolled, pasta machine rolled, or the icebox method. I don't own a pasta machine, so the choice was immediately made for me. Unlike the last two challenges, these are something I've baked before. 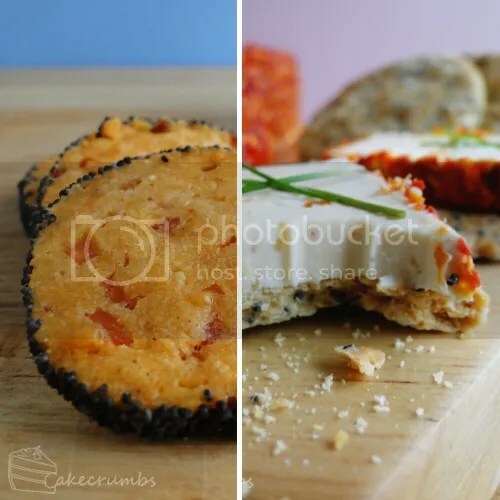 I've never blogged any of my recipes, however, so it was a good excuse to return to two of my favourite recipes and share them with you guys. The first recipe is hand rolled. These two-seed crackers are as easy as they are delicious. I've made these for a few parties in the past, though they suit us just as well to sit at home with and nom at lunch time. We had these with sweet chilli cheese and chives. Sweet chill cheese is one of my favourites, so any excuse will do. 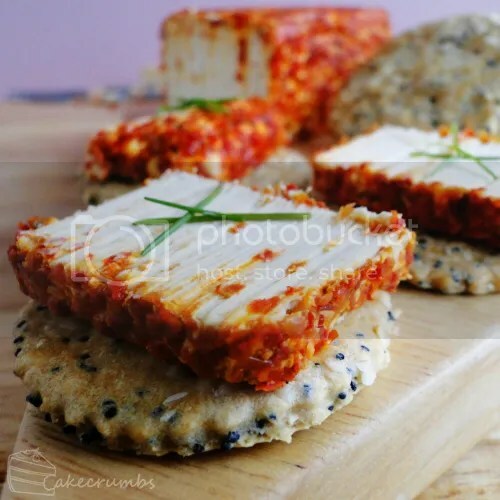 These crackers are light and crunchy but without a dominant flavour, so they suit just about any topping. The next batch was made using the ice box method: these are bacon and parmesan biscuits. Unlike the others, they do have a strong flavour on their lonesome. You'll probably be tempted to demolish these straight out of the oven. We eat any wonky ones hot and try to resist the rest while they cool. I love making these. Probably because this step is a heap of fun. 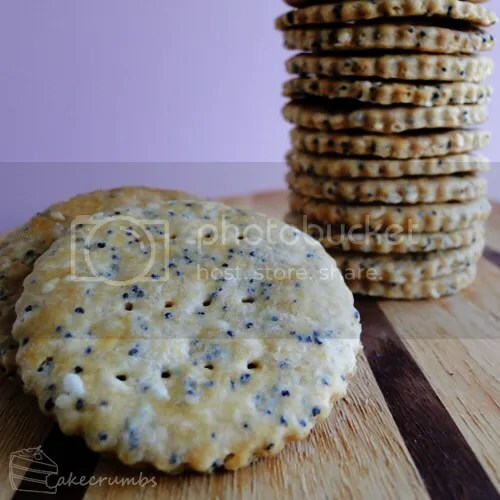 But more than that, the outer ring of poppy seeds is so effective, it really dresses up an already appetising-looking biscuit. We had these with a spicy capsicum dip. They go well with any number of savoury dips, dressings and a whole range of cheeses. I've served them at parties as canapés dressed with fruit and cheese. They're also great with fresh made tomato jam and basil for the same purpose. If not making these for a party, I usually make a half batch because this makes a heap of biscuits. You could also freeze some of the logs for later use if desired: just defrost them in the fridge before slicing. Preheat the oven to 180°C (160°C fan-forced/350°F). Grease or line two baking trays. Sift flour, baking powder and salt into a bowl. Add the seeds and season with pepper to taste. Stir to combine. Using your fingertips, rub the butter into the flour until the mixture resembles fine breadcrumbs. If you don't want to get your hands dirty, pulse in a food processor until just combined. Make a well in the centre of the flour mixture and add 3/4 of the water. Mix together with a flat bladed knife, using a cutting action. The trick all the way through is to not overwork the dough or else it will become tough. Add the remaining water if necessary; the mixture will come together in soft beads. Gather dough into a round ball. Handle gently – do not knead it. Divide dough into two portions; roll each between two sheets of baking paper until 2mm thick. Using a 6cm cutter, cut rounds from the dough. Pile any leftover dough on top of itself (again, don't knead) and gently re-roll. Bake rounds for 20-25 minutes, or until lightly golden. Transfer to a wire rack to cool. Printable version of the above recipe is here. Beat the butter until light and creamy; gradually beat in hot water. Sift flour and paprika into the bowl and stir to combine. Stir in bacon, parmesan and water, then season to taste with pepper. Add more water if necessary. Divide dough into quarters; roll into 3cm thick logs. 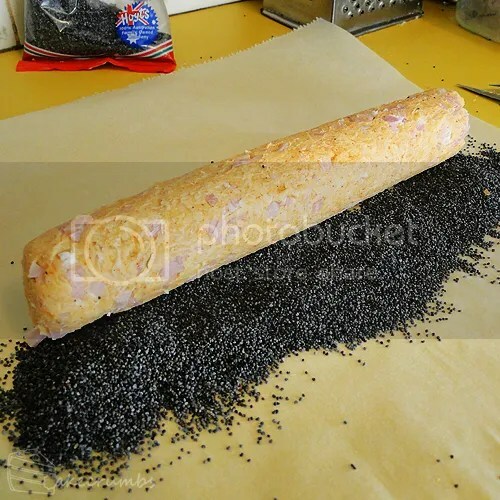 Spread poppy seeds onto work surface and gently roll logs in seeds until the exterior is well coated. Wrap in plastic wrap and refrigerate for at least 2 hours. Preheat over to 180°C (160°C fan-forced/350°F). Line or grease two baking trays. Slice the logs into 5mm slices; place on prepared trays and bake for 15-18 minutes. Place on a wire rack to cool. 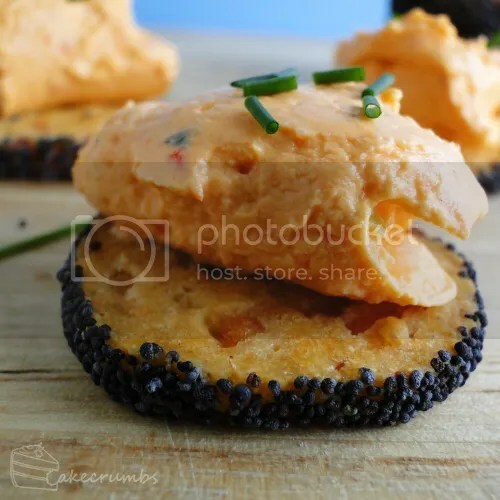 WOW your parmesan bacon crackers sound wonderful, the poppy seeds really dress it up. I must say the sweet chili cheese looks so good! These were great for snacking on. I particularly liked the bacon and parmesan ones, soon after coming out of the oven. Oh my GOSH these both look so good!!! 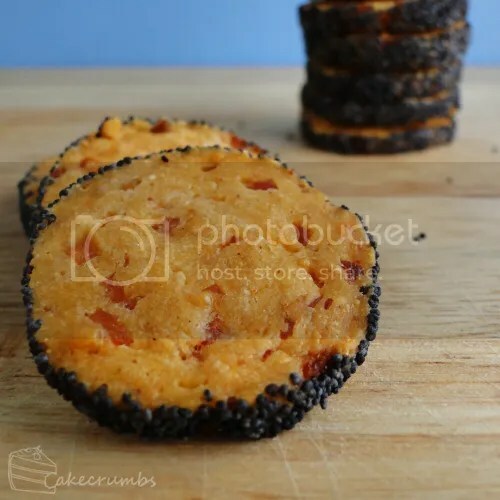 Bacon and parmesan is a brilliant combo, and that picture of the chili cheese on the seedy cracker is making my mouth water. Well done! 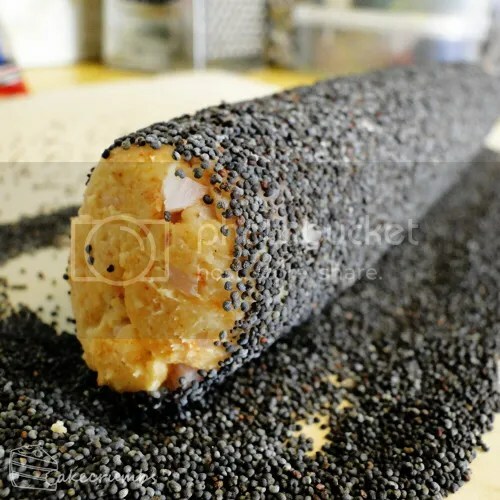 Great idea to roll in poppy seed 🙂 They’d work a treat as canapes at a party.